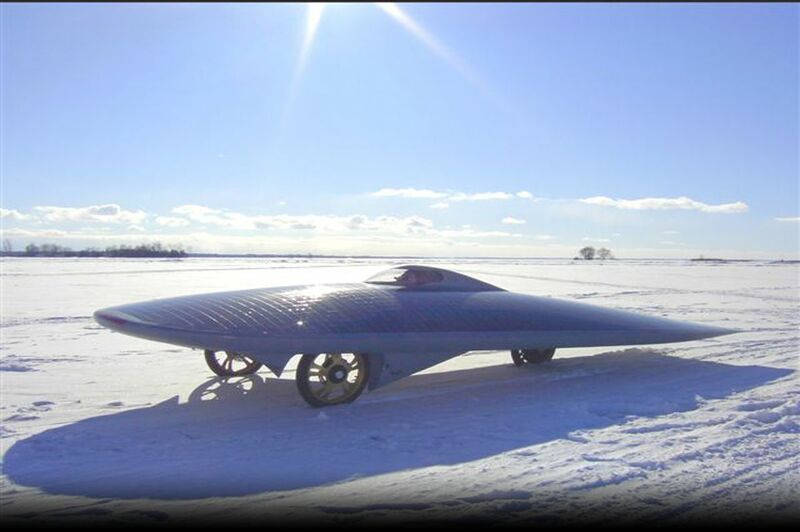 I arrived in Toronto on Sunday, and have spent the past 3 days working on the solar car. The car has been just north of Toronto in Pickering; up on blocks in Peter’s basement. The basement resembles that of a ‘mad scientist’ with every type of tool, machine and computer with in-process projects scattered throughout. It is a perfect place to work on the car. We’ve overhauled most features including tires, batteries, suspension and the lifting arm that picks up the top of the car. Wednesday, Marcelo, Peter, Ben and I worked through the night, making the car operable and ready for some scheduled TV interviews in the morning. Rob spent the day chasing around town to pick up the trailer that we’ll use to haul the solar car to Inuvik for the start of the Ice Challenge. Around 6 am, we took the car off blocks and pulled it out of the garage. We loaded the car onto a trailer to take it to the TV studios. This was the first time that I saw the car on the ground. We raced around trying to get everything ready just in time as the sun came up to start a beautiful chilly morning. …and an interview with Discovery Channel’s “Daily Planet” show. This interview will be aired early the week of the 29th. At the end of the CTV interview, Marcelo drove the car down the road for a final shot to close the interview. This was the first time I saw the car driving . The car seemed to be saying it was thankful for all of the repairs and maintenance and that it was happy to be soaking in the sun’s rays and driving down the road again.